Home Case Studies Sally P.
First Entry, May 14, 2010: Sally’s health problems began very early on. She was a birthday gift to me, a 3 month old feral kitten who had been rescued along with her litter mates. It took me several months to gain her trust and just about the time she started coming out of her shell, she began vomiting several times a week and had very bad gas. She was diagnosed with IBD at the age of six months. The vet recommended a diet free from chicken so after much searching, I started her on Pro Plan Turkey and Barley. It didn’t eliminate her vomiting but reduced the frequency. At eight months, during a re-check for an upper respiratory infection, the vet mentioned that she had a loud heart murmur (grade III/VI). She had extensive blood work and several X-rays taken before undergoing a cardiac ultrasound to determine the cause of the murmur. She was diagnosed with hypertrophic cardiomyopathy. The walls of her left ventricle were thickened but the internal medicine vet felt that it wasn’t bad enough for her to need medications for it. However, at her follow up a year later, it was obvious her disease was progressing rapidly so she was started on diltiazem (generic for Cardizem), 7.5 mg twice daily. Fortunately for me, with the help of a pill shooter, Sally was relatively easy to pill. Sally’s health has always been a balancing act, everything affects her strongly. Her reactions to medications were always severe. Annual vaccinations made her ill every time, even sending her to the emergency vet twice. However, her HCM proved to be relatively easy to manage. After several years on diltiazem, her cardiac function improved greatly. She continued to vomit several times per week and was constipated more often than not thanks to her IBD, but she seemed to thrive in spite of it. Sally’s diet consisted of either Pro Plan Turkey and Barley or Eukanuba Lamb and Rice, the only two dry foods that I had been able to find without chicken. I knew that canned food would be better for her but Sally has always been a grazer, making dry food a better option than canned. In July 2000, Sally had a bout of congestive heart failure. For reason(s) unknown, her lungs filled with fluid and she had trouble breathing. Her vet upped her diltiazem to three times a day and she was put on 12.5 mg Disal (or furosemide, Lasix), a diuretic to help her eliminate excess fluid. The increased medications caused her to lose her appetite. Sally has always been a petite girl, only weighing 10.5 lbs at her heaviest, so it was very important to get her to eat. Finally, after force feeding her for three days, her vet gave her an appetite stimulant and she began eating on her own. We decided to keep her on the Disal in case her HCM was worsening to keep the possibility of another episode of heart failure to a minimum. Sally recovered and did very well for the next couple of years. In December 2004, shortly after her 10th birthday, she was diagnosed with stage 2 chronic kidney disease. Her vet recommended a switch to prescription K/D. I was afraid of what that would do to her IBD so I gave her a 50/50 mix of K/D and Eukanuba Lamb and Rice. Her BUN and creatinine came down a bit and stabilized. She started losing weight, dropping down from 10 to 8 lbs over the span of a year, but after a senior blood panel and a thorough check up, her vet felt that the weight loss was mostly due to her age and reduced activity level, not so much her IBD. After four years of taking Disal, her vet and I agreed that it would be a good idea to stop it and give her kidneys a break. Starting in the fall of 2007, there were some subtle changes that at the time I put down to Sally’s age and the effect it was having on her IBD. She was very gassy and her stomach would rumble and gurgle so loudly that it could be heard across the room. She would have random bouts of diarrhea that would go away just as soon as I’d made my mind up to take her to the vet. She began vomiting more often, sometimes 2-3 times a day. 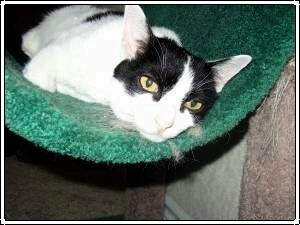 I took her in for a “senior” check up in February 2008 and she had an elevated white blood cell count. There was also blood in her urine so she was treated for a UTI. When I took her back in for a re-check, her urine culture was clear but her white blood cell count was unchanged, still over 26,000. A second CBC done three weeks later showed no change so an appointment was scheduled for tests to determine the cause. On April 15, 2008, the day before her appointment, Sally vomited several times. It was different than her usual – a thick liquid with a very foul smell. She was not able to poop and I began to fear that she had some type of blockage. By the time her appointment came round the next morning, she was extremely weak and lethargic. I was frightened to hear that she was now down to 7 lbs, losing 1 lb in only six weeks. X-rays didn’t show anything except that she was very constipated. An abdominal ultrasound was inconclusive, but her vet was starting to believe that she had lymphoma, a diagnosis that could be confirmed with an endoscopic biopsy. They kept her overnight – fluids for dehydration, an enema to relieve the constipation and pre-op blood work. Early the next morning her vet called me with bad news. Sally’s blood was very slow to clot and he was afraid that she could develop a bleed after surgery, either in their office (they don’t have 24 hour care) or at home with me where the nearest emergency vet was 45 minutes away. He referred her to a specialty hospital down in San Diego. I was fortunate enough to get an appointment for Sally the next day. After reviewing her history, the internal medicine vet performed a repeat abdominal ultrasound. He found that her intestines were extremely thickened with lots of layering – proof that her longtime IBD had become something more serious. Her pancreas was enlarged and her kidneys were small and scarred. He was 95% positive that she did have lymphoma but wanted to do the endoscopic biopsy in order to be sure that it wasn’t just severe IBD before starting treatment. Her PIVKA test clotting time was 31.5 seconds so she was given an injection of vitamin K before the procedure. There was some excessive bleeding but it was able to be controlled. Sally came home the next day and we began the wait for the biopsy and cobalamin/folate test results. On April 23, 2008 Sally was diagnosed with small cell (low grade) intestinal lymphoma. She was also found to be deficient in vitamin B12, a condition common in cats with IBD and intestinal issues. She was prescribed B-12 injections, once a week for four weeks, then one every four weeks. Her chemo protocol was daily prednisolone and 1 mg chlorambucil (generic for Leukeran) every other day. Her chemo was delayed as she had developed an upper respiratory infection and needed to be on an antibiotic for several days first. I was terrified of the chlorambucil. I felt like I would be poisoning her with it so I decided that it would be safer to start her prednisolone first and then begin the chlorambucil once she finished her antibiotic. On May 1st, after only four doses of prednisolone, we came home to find Sally struggling to breathe. I rushed her to the emergency vet and she was diagnosed with pulmonary edema and congestive heart failure. A normal side effect of prednisone/prednisolone is fluid retention and, because of her HCM, the fluid collected in her lungs and chest cavity. She was released after 24 hours in an oxygen cage and was put back on 6.25 mg of Lasix twice daily. Still sounding raspy and very weak, Sally was thrilled to be home again. I started Sally on chlorambucil on May 7th. It had a very strong effect on her. She was extremely lethargic, only getting up from her blanket to eat and use the litter box. She looked horrible, skinny and unsteady on her feet. Her internal medicine vet changed her prescription to methylprednisolone, which is the most broken down form of prednisone. He felt that it would be much less likely to cause the same fluid retention as the Prednisolone had. Unfortunately history repeated itself and she had another bout of congestive heart failure only 2 ½ weeks after the first one. Even with the Lasix, this episode was much worse. The excessive amount of diuretic needed to remove the fluid from her lungs had a negative effect on her kidneys and her creatinine rose to 3.4. She needed more time in the oxygen cage this time around and it took several tries for her to be weaned off of it. I took her back to her internal medicine vet for a re-check on May 21st. She also saw the cardiologist and a cardiac ultrasound revealed a leaky mitral valve in addition to her HCM. We decided to give her a three month break from any kind of steroid to give her heart a chance to recover before trying her on budesonide, a different type of steroid which is made to be broken down in the intestines, greatly reducing the chance for fluid retention. For her leaky mitral valve, the cardiologist prescribed enalapril (Renitec, Vasotec). The usual dose is 2.5 mg once daily but it can affect kidney function so she was started on 1.25 mg to see how her kidneys reacted. A CBC was done three weeks later and her BUN and creatinine were still elevated so she stayed on the smaller dose for three more weeks. Her next CBC showed that although her values were still elevated, they were stable so we tried her on 2 mg to see how she’d do. Three weeks later at her next CBC, her values were still stable so we moved up to the full dose of 2.5 mg. Another CBC three weeks later showed no change so she could remain on the full dose for the time being. Sally’s response to chlorambucil seemed very slow to me, although typically cats don’t show improvement until they’ve been on it for 8-10 weeks. Her CBCs showed that her white blood cell count was starting to come down and the B-12 injections were helping her appetite, but her overall demeanor scared me. Most days she only left her bed to eat, drink and use her litter box. I found her quite a few times just lying in her litter, as if the effort to get in the box and use it wore her out. Her coat was greasy, her eyes were dull. Even though she was gaining some weight, her spine and hips protruded. She seemed very weak and frail and I wondered many times whether I was doing it all for her benefit or mine. After five weeks on chlorambucil, she began to vomit on the days she didn’t take it, always between the hours of 2-5 am. After vomiting she’d collapse, often times in what she just threw up. Her vet recommended famotidine (generic Pepcid) but something happened before I had a chance to give it to her. Right at the nine week mark, Sally began to come around. She had more energy and more interest in her surroundings. She grew stronger and began grooming herself again. The “sparkle” was back in her eyes. I only hoped she was doing as well on the inside as she was on the outside. On August 30, 2008 I took her for a re-check to see how her intestines looked and if her heart had improved after its three month vacation from steroids. An ultrasound showed the impossible – Sally was in remission! Her IM vet was dumbfounded. Because she was unable to tolerate the prednisolone, her prognosis was only six months, compared to the usual 2-3 years for other cats diagnosed with this type of lymphoma. Remission was thought to be out of the question, but the layering and thickening seen in her intestines just four months earlier was gone. Her pancreas remained enlarged and her kidneys were still small, but all of her lymph nodes were back to normal. “No sign of active cancer” – What sweet words those were! Next I worked on bringing her creatinine down. She had been at 3.3 and 3.4 since her first bout of heart failure on May 1st. I had since discovered that the Eukanuba Lamb and Rice that I had been feeding her for so many years now had chicken as its first ingredient. After much research, I decided to change her to a 50/50 mix of K/D and prescription Royal Canin Limited Ingredient Lamb and Green Pea. The Royal Canin worked on several levels – low protein (30%) for her CKD and no grains or fillers with a good protein source for her IBD/Lymphoma. After two months on this diet, at her regular three month CBC, her creatinine was down to 2.9, then to 2.8 where it has been pretty much for the last two years. Sally has been on the same regimen since her lymphoma went in to remission. She takes enalapril, Lasix and diltiazem every morning and Lasix and diltiazem every evening. She also gets Cosequin in the mornings for her arthritis since the normal treatment for it is prednisone. In October 2009, I took her to the emergency vet for what turned out to be a sore in her mouth that had ulcerated and irritated her throat. Because it was so painful, she stopped eating and her weight (which had leveled off around 7.5 lbs) plummeted to 6.5 lbs. The decision was made to temporarily stop her chlorambucil until her mouth healed. Sally had begun vomiting again over the summer and not even famotidine had stopped it. If her vomiting continued unchecked, it could delay her healing process, which was already slow because of her abnormal immune system and she would continue to lose weight. It took about two months but she finally got a clean bill of health. We decided to keep her off the chlorambucil a bit longer as her last couple of CBCs before her visit to the emergency vet showed a declining red blood cell count. While it was still within normal range, it was at the very low end. Sally’s last CBC was done at the beginning of March 2010. Her regular vet forwarded her results to her internal medicine vet. When I spoke with him, he expressed amazement that she continues to do so well since her outlook was very bleak in the beginning. He told me to keep up with what we were doing (“if it ain’t broke, don’t fix it” were his exact words). She is now 15 ½. She has slowed down quite a bit. She spends more and more time on her heated blanket. She makes “rest stops” going to and from the water and food dishes and litter box. She is very unsteady on her feet and her arthritis continues to worsen, but overall she is still doing better than expected. I have made the decision that if her heart and kidneys last long enough for her lymphoma to come out of remission, I won’t pursue any further treatment. I don’t want to subject her to anything invasive and uncomfortable as she has been through so much already. Her health is a delicate balance and some day it will tip in the wrong direction. Until then, I cherish every single moment I have with her. As long as she has more good days than bad, we continue the fight. September 3, 2010: Towards the end of May, I began noticing that Sally was sleeping more and seemed less interested in her surroundings. Her appetite was good but she had started to drink a lot more water than usual, so much so that she would lie down next to the water bowl to rest, then drink more, then rest, etc. Then in June I noticed that the consistency and appearance of her poop had changed. Since a young age, Sally’s IBD has always made her just a bit on the constipated side. Her litter box deposits have always been small, dark and hard. Now they were large, pale and soft (but formed). The only other time it looked like this was during the fall and winter of 2007/2008 before her lymphoma diagnosis. This plus the return of the tummy “gurgles” concerned me a great deal. Fearing the worst, I took her in for a check up in July. After hearing about the symptoms I had noticed, her vet felt that her lymphoma was out of remission. Her weight was surprisingly good, 8 lbs 4 ozs, but he could feel that her intestines were inflamed and her spleen felt “meaty”. I told him that I had decided that Sally would not go through any more invasive procedures or treatments. She is almost 16 and has already been through so much in her life. I was fine with using medications to treat her but nothing more. He felt that budesonide was our only opportunity to make her more comfortable. However, because of her history, there remains a chance of fluid retention and heart failure if she takes it. But he felt, as did I, that he’d rather try to make her feel better and fail than to do nothing at all. He drew blood for a complete panel and a urine sample to make sure there wasn’t another reason for her excessive thirst. Sally’s test results were disheartening. Although her white blood cell count was still in the normal range, her red blood cell count had dropped quote a bit. Her hematocrit was 26%. A count of 23% is considered anemic. Her UN had risen to 70, not horrible but a definite reason for her water consumption. Her creatinine remained at 2.8. At the beginning of the year, I had been worried about her red blood cell count dropping so I had asked for a break from her chemo. It turns out that her kidneys were the cause for the drop in her RBC, not the chemo, so I felt as if I had left the door open for her lymphoma to return. Our new course of action: Her vet suggested changing her to spironolactone, a diuretic that is more “kidney friendly” than furosemide. So we don’t change too many of her medications at the same, we decided to try her on the spiro first to see if it helped her kidney values. Then we would try her on budesonide to see if she can tolerate it. These two drugs are kind of our last resort. If the spiro doesn’t help and her kidneys continue to worsen, she’ll become anemic and I’ve already decided not to try her on Epogen. If we give her the budesonide and it causes heart failure, her kidneys are too fragile to handle the amount of diuretic that would be needed to remove the excess fluid in her lungs and chest cavity. Her vet suggested starting her back on Leukeran to see if that would slow the progress of her lymphoma, but it will more than likely cause her red blood cell count to drop further. We don’t have very many avenues open to us at this point. I have always hated the phrase “quality of life” but it applies at this point in Sally’s life. She is up and down all day long, sometimes good, sometimes not. She still has her moments where she is interested in being a part of things, interacting with our other cat and dog, but most of her day is spent curled up asleep. There have been a couple of nights where she has been very restless, moving from place to place in an attempt to get comfortable. Her arthritis continues to worsen as well, leaving her back legs very weak and wobbly. Happily, she is still as determined and stubborn as ever, demanding attention and commandeering my husband’s side of the bed. I can see that our time together is growing short so I’m trying to make the most of it. At the same time, I am trying to prepare myself for what is to come. She and I have been together for over 15 years and I can’t imagine life without her. Just the thought of not being able to rest my head on her chest and hear her loud rusty purr brings tears to my eyes. Sally has been living on borrowed time most of her life. She has been given poor prognoses more times than I can count and always managed to beat the odds. This time however, I fear that the odds are just too high for her to overcome. She loves nothing more than to make the humans in her life appear foolish so she may not be down for the count quite yet. I am trying not to get my hopes up but will continue to make each moment we have together count. July 31, 2011: After a lot of thought (and a certain amount of fear of the unknown), I decided not to try Sally on budesonide. Even though the chance of fluid retention was slight, that was still just too much for me to want to risk. Her heart has always been relatively easy to treat and very responsive to medications but I felt that another go round with heart failure would be too much for her fragile body to take. She didn’t seem like she was in any pain, just bouts of discomfort every once in a while. I also decided against spironolactone as a replacement diuretic. Sally was just too old for “experimenting” in my opinion. She has been through so much, enduring everything I subjected her to stoically and without a fuss. At 16, I just couldn’t ask her to do it anymore. In the fall of 2010, we stopped her meds. All of them, one at a time. None of them were improving anything. In fact, I felt that a couple of them were only adding to her troubles. Everything wrong with Sally is terminal, nothing she has can be “fixed”. I had already stopped the chlorambucil; no point in continuing it when her lymphoma was out of remission. I started with the cardizem, tapering it off slowly. Next came the furosemide and then the enalapril. Her water consumption lessened with the removal of these last two meds so I felt that this had been the right decision for her, even though it was an admission that I’d done everything I could for my little girl and all that was left to do was to make her as comfortable as possible. Winter is a difficult time for Sally. She has always been petite, with a thin coat and not a lot of body fat to insulate her against the cold damp weather. The only treatment for her worsening arthritis is an anti-inflammatory which is absolutely out of the question because of the high possibility for fluid in her lungs and chest. To keep her warm, I took an electric blanket and wrapped it in a small down comforter and topped it with a fleece blanket which could be easily cleaned after one of her early morning throw ups. Sally has never willingly slept in any bed we ever made for her, nor has she ever slept in the same spot for very long (traits that I have always attributed to her feral start in life). Fortunately she loved the little heated bed and, with the added attraction of the fireplace at night, only moved from her “happy place” to eat, drink and use the litter box. Sally did better than I expected her to off her meds. She continued to have her good days and bad, but just kept plodding along. The winter cold left and her spirits seemed to improve. All her symptoms remained – vomiting, pale loose poop and excessive water drinking – but she seemed content, like she still wanted to be here. April 23, 2011 marked a bittersweet anniversary. Three years before, she had been diagnosed with small cell lymphoma. She had outlived the initial prognosis of 18-24 months, much to my delight. I sent a note of thanks to her vet, for without his care and dedication, I felt that I would have surely lost her a long time ago. The celebratory feelings were short lived. Soon after I noticed that Sally’s appetite had increased. A lot. I could barely keep her bowl full. Seeing this from a cat who has always been a grazer concerned me greatly. In addition, we could see that she had lost weight. She seemed very frail, less “there” than before. My husband even mentioned that he felt like she was starting to fade away. With a heavy heart, I made an appointment for her to see Dr. Hansche, fully believing that her and my luck had finally ran out. I adore Dr. Hansche. I love his way with animals. When we take our pug to see him, he lets her crawl all over him snorting and snarking, laughing all the while. With Sally, he’s very respectful, handling her gently in deference to her age and arthritis. He always starts out by snuggling with her, petting her and kissing the top of her head. This particular exam took place on the floor as he could see that she was uncomfortable on the slippery exam table. Right away he noticed how thickened her intestines felt, mentioning that while they had always felt inflamed due to her IBD, he could tell they were definitely worse, indicating the progression of her lymphoma. Incredibly her heart sounded strong and her lungs clear, even after being without her heart meds for almost 8 months. He felt that with the weight loss (down 1 lb to 7 lbs), the increased appetite and the thickened intestines, these were all signs that her lymphoma was picking up speed. With her age and multiple illnesses, there was nothing to be done except to keep her comfortable. The blood work would confirm his feelings, with her values all pretty much the same as her last visit, with the exception of her elevated white blood cell count. It is very hard to hear that there is nothing left to do for your pet. Even though I knew it in my heart, it was official now. Dr. Hansche said that her time was coming to an end, although, with her penchant for outliving her prognoses, he couldn’t say how long. She will continue to get thinner and weaker as the lymphoma robs her body’s ability to nourish itself. That’s only if her kidney disease doesn’t worsen, either causing her to become anemic or her kidneys to shut down. And only if her heart continues to remain stable. The delicate balance we had maintained for so long has tipped in the wrong direction and there’s no question of being able to get it back. All of her four diseases are life-ending and now it’s just a question of which one. Her 17th birthday is in November and now, more than ever, I fear she won’t be around to see it. If she’s not, it won’t be for lack of trying on all of our parts. My head knows that I’ve done everything possible. She could have left me at so many points in her life but she didn’t. I know that all I can do is continue to support her as I’ve done for all these years. She gets what she wants, when she wants it. As simple as that. A lot of people have asked why I don’t simply let her go if she’s so bad off. It’s hard to explain to them, but I can tell by looking at her that she still wants to be here. She still has that “Sally sparkle” in her eyes. She can still seek my husband and I out and demand her share of attention when she’s in the mood. Yes, there are times when she looks horrible and seems miserable, but then she’s perky and interested, wobbling up to me in the kitchen and asking for a treat with her silent meow. We’ll keep doing what we’re doing as it seems to be right for her and just take this fight one day at a time. August 30, 2011: Around August 16th, Sally had a bad couple of days. Very weak and even wobblier than usual, with a real “blah” demeanor. The only thing that had not changed was the monster appetite she’s recently acquired. Her poop has gone from soft but formed to very runny, which is just like a knife in my heart. My little girl is still there, with that loud rusty purr that starts in an instant when you pet her and love on her, but she just seems so very tired. Sally has been as healthy as her chronic conditions have allowed her to be. I think my one and only regret will be that I could never give her 100% good health. It’s not something I could have ever changed, but then again, I wouldn’t have changed one second of the last 16 ½ years we’ve had together. She has been my baby girl ever since the moment I laid eyes on her and the knowledge that her conditions were life threatening only made the time together more precious then had she been “normal”. After a week of thinking it was “time”, she started feeling a little better! She made a more normal looking poop, a little on the small side but more formed. She even had enough energy to jump up on the couch to lay by me while I was eating dinner. Now she’s still weak and not 100% but I’m cautiously optimistic that we’re going to be able to dodge the bullet this time. I guess I can say that any overreaction is due to her grim prognosis at her last vet visit. I know her time is short and I guess I’m trying to prepare myself for the worst. She had a pretty bad 4 days, no question of that. She has a little of that “sparkle” in her eyes. I know that what’s coming up is inevitable, but at least for awhile, I can push it to the back of my mind for a bit. Sally’s doing a little better than the bad days last week but she has lost some ground and I don’t think she’s going to get it back. Her poops are really soft again, not liquid but not formed as before. She can still get up and move around, but she seems tired and is still a little on the weak side. There just doesn’t seem to be much of her left, almost as if she’s fading away. I think we’re getting closer to decision day. The only thing keeping me from taking her in this very moment is that I still don’t feel that she’s in any pain. Some bouts of discomfort but not bad. That determination of hers is amazing. I think that’s pretty much all that’s keeping her going. Our goal is to keep her comfortable and we do whatever we need to accomplish it. I’ve been combing her at night and she turns that purr motor on full blast. I’ve been sleeping on the couch at night so I can be near her. Just trying to make the most of the little time we have left together. I’m also trying to keep myself as busy as possible because when I let my mind think about it, I can’t stop the tears. November 16, 2011: After Sally’s last visit with Dr. Hansche in June, we knew it was just a matter of time before we’d have to let our girl go. Her bad days were starting to catch up with her good days. It was obvious to anyone who looked at her that, while content, she was definitely slipping away. Sally’s appetite remained voracious, but she started to look gaunt and frail. Her spine and hips were easy to see and I could no longer use her beloved flea comb on her. I tried using my son’s baby brush and she liked it, but it didn’t elicit the purrs of ecstasy that the flea comb always had. Her fur looked awful, greasy and thin, so we’d use a bit of cornstarch to help her look better. She stopped wanting to go outside – it just required too much effort. Even walking through the house became a painful experience both for her and for whoever was watching her. Her back legs could barely support her and she would weave back and forth, clearly frustrated by her body’s inability to go where she wanted it to. She would insist on getting up on the arm of the couch and hated that I helped her up but after falling off several times, even that little joy was taken from her. Most of her time was spent on her heated blanket. It seemed as if the lymphoma was eating away at Sally right in front of our eyes. She had done so well for so long that it was hard to admit that we were fighting a losing battle. But at the end of September, my husband and I decided that we could no longer put her through the rigors of every day life. I called Dr. Hansche and told him what we had been seeing and what we had decided to do and he agreed that it was time. I told him that I didn’t want any exam or blood work as I knew exactly what he’d find. My heart told me that it was the lymphoma and what I was seeing day after day was enough of a confirmation for me. We scheduled her to be put to sleep a week later so we’d have time to say our goodbyes and to make arrangements. The next seven days were excruciating. We had always had “family” pets when I was growing up and my mother had always been the one to handle the last trip to the vet. Sally was my first pet and my first experience with the PTS process. Looking at her, I simply couldn’t picture life without her in it. There was a certain amount of relief and comfort in making the decision to let her go. She had become so fragile, we were consumed with making sure she was okay. One of our biggest fears was that our rambunctious toddler would inadvertently hurt her or even worse, send her on her way, a thought that neither my husband nor I could imagine living with. But the thought of letting my best friend go, of no longer being able to rest my head on her chest to hear that loud, rusty purr, to not be able to kiss the top of her head or hold her paw or run my hand over her soft fur… I just couldn’t fathom it. October 8th was a quiet day. The night before, my husband had made a special trip to get Sally’s very favorite food for dinner; Popeye’s Chicken – so I warmed up the left over chicken for her last snack. I made a paw print impression in clay and we spent as much time as we could with her. Oddly enough, Sally wanted attention and actively sought us both out, almost as if she knew this was it. She also asked to go out on the patio, something she hadn’t done voluntarily in a long time. When it was time to go, we took our son to my parents’ house so my husband and I could concentrate on just Sally. In the Quiet Room, we had her on the couch between us, on her favorite quilt. Dr. Hansche came in and talked with us. He thanked us for letting him be her vet and for taking such good care of her. He also said that as a vet, there were some patients that touched your heart a little more than others and that she was definitely one of those. He said his goodbyes and then gave her the sedative, leaving us a few minutes to tell her how much we loved her. I have no regrets, no guilt about our decision. To let Sally go on any longer would have been selfish. The lymphoma was just burning through her, taking all of her strength and energy and leaving just a weak, frail vessel. 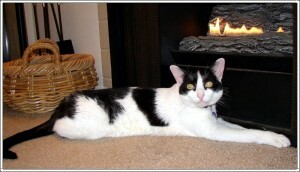 Sally had a wonderful life and lived longer than some cats do without all her health issues. From the date of her diagnosis on April 23, 2008, she lived 41 ½ months with lymphoma, 21 of those months in remission, far exceeding the average lifespan of 18-24 months after diagnosis. She lived her whole life with IBD and HCM, taking daily medications for all but the first and last years of her life. I have always tried to share her story so that it might bring others hope. You can give a cat with multiple, chronic health problems a long, full life. Dr. Hansche said, if we are lucky, we find that one pet that we can make that deep connection with. A soulmate in fur, if you will. I will always have cats in my life, but there will never be another Sally. She was one in a million and it was a privilege to share my life with her. She was my best friend and soulmate and will always have a special place in my heart. Rest in peace mama’s angel. You’ve earned it.